Following the December consultation, the Council has released its final proposals. 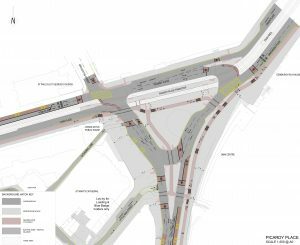 The gyratory remains, but, within that context, there are major improvements for cycling and walking.The proposed design is below. The full Committee report is here. Whilst Spokes is against the whole gyratory concept, the Council argues that for reasons of traffic flow, and the GAM agreement with the government and developers, this is currently the only realistic option. However, the new design provides significantly more useable public space than in previous iterations of the design and cycleroutes which are far clearer and more direct. Picardy design for decision by Jan 2018 Transport Committee and Full Council. [Click for a higher res jpg]. It is likely that the report will be approved by councillors, though possibly with some amendements. Leith Street is beyond the drawing, but the Committee Report suggests that it will be fully re-opened to traffic once the current works are complete (even though the current closure seems to be working reasonably well). 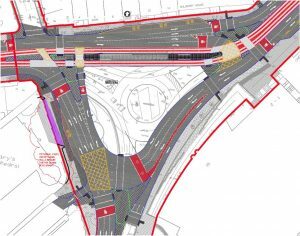 We argue strongly that, as the minimum, it should remain closed to uphill traffic between Calton Road and the Waterloo Place junction, pending the outcome of the City Centre Transformation discussions. Whilst this would require a traffic order, there is just time for this to be processed if acted on rapidly. This continued closure would allow for footways of a sensible width (instead of the council’s proposed 2m footway pinch-point) and would allow at least an uphill cycleroute as the two uphill traffic lanes could be reduced to one, for buses and emergency vehicles only. The drawing does not show cycleroute widths. The minimum official recommendations for 2-way cycleroutes is 3m, ideally 4m, and it is essential for the major routes here that the width is not compromised. A cycle crossing, from the north east corner of the inner triangle to Union Place, is essential – the plans suggest a pedestrian-only crossing. This would serve people wishing to turn left into Union Street or Gayfield Square, or to get to the Picardy Place shops. It would also be vital for eastbound cyclists during the possible 2 or 3 years before the Picardy cycleroutes are fully connected to the Leith Walk cycleroutes. Broughton Street connections inward and outward have been improved but remain problematic. Discusssions on the details here are vital. Tram stop platform – Although this would be a moderately significant change, consideration should be given to platforms on either side of the tramlines (as at several existing stops) rather than one platform between the lines. This would gain a significant amount of space which is currently wasted beyond both ends of the platform, where the tracks diverge – at the west end of the stop that space would be helpful in designing the very tricky Broughton Street junction, and at the east end it would make a pedestrian/cycle crossing simpler. Adjacent tramlines, rather than separated tramlines, may also allow more direct cycle crossings. Tram passengers would benefit by being able to get off the platform anywhere instead of having to walk down the platform to the tramline crossing point. Bus/tram interchange would be simpler – and could be improved hugely by allowing some buses to use the tram bahn and platforms, as is common in mainland Europe tram systems. If you have comments and/or wish to support any of our points, please email your councillors urgently. Find them here. Ask them to speak to the Transport Convener, Cllr Lesley Macinnes and to their party’s Transport spokesperson. Retweet our tweet of this article. It is interesting to compare the latest plans with the version from 10 years ago. We have certainly come a long way since then, albeit the basic concept remains.